Information about the Freesia Group and the events it organises for the Cancer Charities we support. We are Freesia Events and part of the Freesia Group. We run regular events to raise money for our supported Cancer Charities here in Spain. 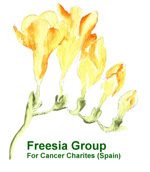 The Freesia Group is a totally legally registered, Salou based, non-profit organisation, founded in 2002/3, raising money for cancer charities here in Spain. All the profits from the activities and events we organise goes directly to the three cancer charities we support – the AECC in Tarragona, CNIO in Madrid and AFANOC in Tarragona. The Freesia group is run by a local team of VOLUNTEERS, giving their own valuable time and energy for this very worthy cause. Freesia volunteers organise all the events, put up posters, collect the money, control the sellers, man the food, drink and the Freesia stalls at our organised events. This is a small social charity event and NOT a market. All the money collected and donated goes directly to our supported cancer charities here in Spain and the ambiance of the event should be based on this.